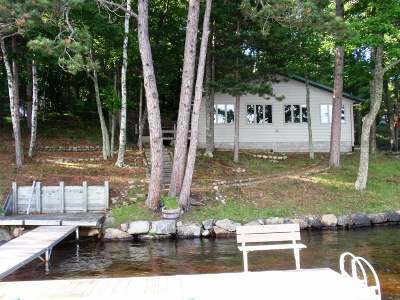 CATFISH LAKE/EAGLE RIVER CHAIN CHARMER- This year-round 3-BR lakeside cottage is perched just 40&apos; from your ripple sand, rip-rapped shoreline, and showcases southern exposure big water postcard views! Located just 3 miles from Eagle River in a wooded and desirable private neighborhood, you will enjoy the easy access to the entire Eagle River/Three Lakes Chain of 28 lakes and all it has to offer! There&apos;s an open concept floor plan, a lakeside wall of windows, and patio doors that lead to a lakeside deck. This charming home/cottage is virtually maintenance free with earth tone vinyl siding, aluminum soffits, vinyl clad windows and a 35&apos; x 11&apos; great room across the front of the home. Included is a light-weight aluminum framed, maintenance-free composite paneled dock with spacious bench area and swim ladder leading into the toe wiggling firm sand bottom. A 2-car garage (Brand new roof and stain on the garage!) rounds out this TURNKEY offering! This one is hard to beat...call today!